What’s your most important health concern? Chances are, you’ll find an article discussing it in a recent issue of Harvard Women’s Health Watch. Are you at risk for heart disease? If you eat a balanced diet, are supplements necessary? Will new drugs help prevent breast cancer? Can simple exercises like stretching and walking have a noticeable impact on my health? Subscribe now for answers to questions like these! Harvard Women’s Health Watch puts you in closer touch with everything that’s happening right now in the new age of women’s health and medicine. New prevention strategies, new diagnostic techniques, new medications and treatments. From heart disease in women to breast cancer, from diet and nutrition to vitamins and supplements, from hormone therapy to exercise and strength training, Harvard Women’s Health Watch focuses on health from a woman’s perspective. when hormone therapy may make sense. If it matters to women, it’s in Harvard Women’s Health Watch. You owe it to yourself to have the best health information available so you can make a real, positive difference in your health and well-being. Subscribe today. I am a retired R.N. and I am extremely disappointed in the medical community here. The only Drs. I trust are the Cardiologist, and the Orthopedic. For this reason I continue to subscribe to HWHW. I think it is imperative for people to educate themselves about their health problems. S.H., Athens, Ga.
From the editors of the Harvard Women's Health Watch. 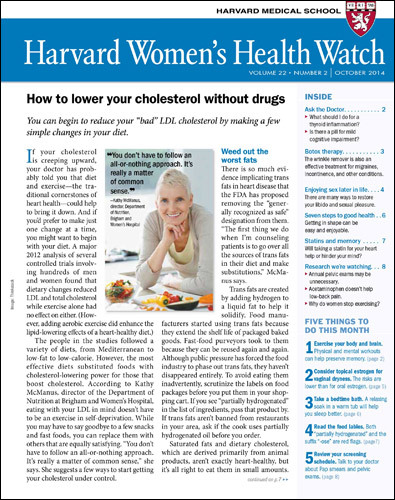 The following are links to online information mentioned in past issues of Harvard Women's Health Watch or to extra information we couldn't fit into the printed version. Web extra for January 2009, "Nine for 2009: Nine ways to healthier eating, Mediterranean style"